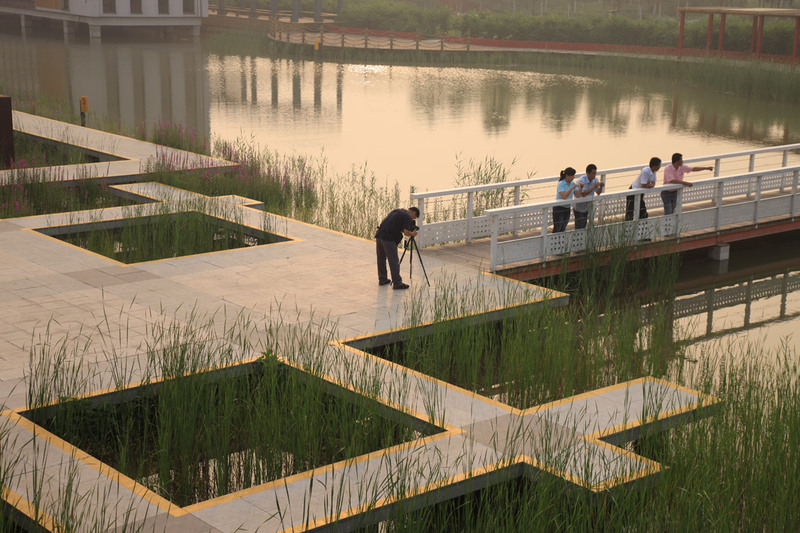 Turenscape architects created a stable garden system and called it self-generated landscape design, so they transformed former dust-heap into nature corner for Tianjin residents. Tianjin district is situated in the north-east of China, its population is about 15 million people and there is no speech about good ecology here. This city is an industrial centre of China: petrochemistry, metal processing, automobile, textile industries and others. For many years there was a great dust-heap on the outskirts. The district got a name of the most criminal. And people required to reform this territory and to improve residents’ lives. In 2003 municipality asked Turenscape Arcitects company to restore this place and in two years new many-tier park Qiaoyuan extended on the area of 23 hectares. Flat and watery spaces, dirty and salty soils don’t give a possibility to plant here exotic and unaccustomed trees and flowers. So architects made some garden spaces and paid an attention to local flora and fauna richness and diversity. Plants are usual for this region and climate, they don’t require a great care. The park made is by special technology which gathers rain-water from neighborhood and carries to plants. Besides boggy soil didn’t make it possible to plant a lot of trees, but to make embankment of some meters also was bad because such way it would impossible to see park from the city. So architects decided to make many levels in the Qiaoyuan park: now there are cascades united by bridges. The new place for relaxation and seclusion became very popular between residents and guests of the industrial city: more than 200 thousands people visited this place. Qiaoyuan has a lot of terraces situated at different levels, also there are many ponds, grass-plots and flower-beds. Paths and red bridges offer people many variants of routs to go here. The park became a favorite place for families with children and even for biologists and architects who do researches here. This is not infrequent example of Chinese planting of greenery in depressive territories. Soon in Beijing the International Park and Garden Exhibition will be. On the Beijing south-west in the place of former dust-heap a great park was built: 513 hectares including 246 hectares of an artificial lake. It’s interesting that there was a great sand-pit of 140 hectares which was used for debris. During three years of building there 12 millions of bushes were planted, former pit transformed into flower valley where eight landscape of the ancient Beijing were depicted. Also many new technologies and materials were used there: watertight bricks on the paths, water saving systems. Thanks to this park an exhibition will be the most dimensioned in the China history. 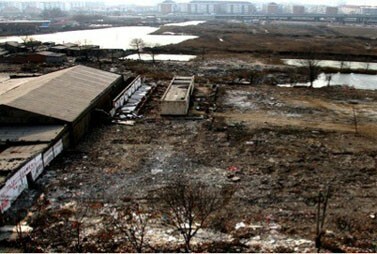 Tianjin and Beijing really demonstrate how many different ways exist to greening dirty industrial zones.